In a nutshell: The Samsung Galaxy Note 8 is an enhanced version of the S8+. Even thicker and heavier, it's a massive phone and won't be suitable for everyone. But it offers the same incredible curved AMOLED display and top-end specs as the S8+, plus an S Pen, dual lens camera, iris scanner and 6GB of RAM, making it the most powerful phone ever. Samsung had to get the Note 8 right, and it looks like they have. Modelled on the Galaxy S8+, the Note 8 is a supercharged version of Samsung's most powerful phone, and it can do no wrong. That is, as long as you have a bottomless money supply and don't mind carrying a phone that's heavier than anything else on the market. Sure, the Note 8 isn't for everyone. If you can't afford it or don't like massive phones, turn away now. But if you're searching for the ultimate in power, it's here. The Note 8 looks just like the S8+, except that it's a tiny bit larger and thicker. You probably won't notice the difference, but you might notice the extra weight. At 195g, it's 13% heavier than the S8+ and more than 25% heavier than the S8. Not scared by that? Then continue reading. The curved edge-to-edge infinity glass display makes even the new iPhone X look, well, square. With 6.3 inches of Super AMOLED screen turning the phone into a window into the virtual world, it's an experience like no other. There's no home button here, but you can unlock the phone with the rear fingerprint scanner, or use the iris scanner instead. The screen is the best on any phone, with quad-HD resolution, ultimate contrast, fully saturated colours and wide viewing angles. The phone is water- and dust-resistant too, and comes in a choice of Black or Gold. The Note 8 runs Android 7.1 Nougat, and the new Bixby virtual assistant. 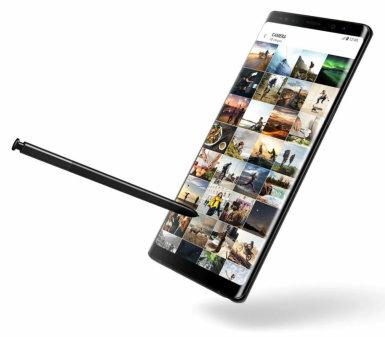 Like all Note series phones, the Note 8 comes with an S Pen. The latest version of the S Pen has been made even more refined than ever, with over 4,000 levels of pressure sensitivity. With the S Pen you can draw emojis, create animated GIFs, annotate notes, or simply use it as a stylus. The S Pen is water-resistant as well. The Note 8 uses the same super powerful Exynos 8895 processor as the Galaxy S8+, but with the RAM boosted up to a massive 6GB. The 8-core processor is as fast as anything you'll find, and the Note 8 flies through every task. Storage is no problem either, with 64GB onboard memory and a microSD slot giving you an additional 256GB of storage if you need it. 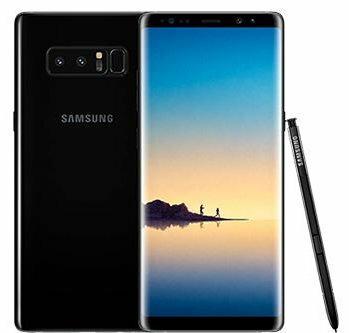 The Note 8 is fitted with a dual lens 12 megapixel camera. The camera incorporates optical image stabilisation and 2x optical zoom, plus features such as auto HDR and 4K video capture with slow motion. With twin cameras optimised for low-light capture, the Note 8 really does enable you to capture superb photos under all lighting conditions. The front camera has an 8 megapixel sensor and a wide f/1.7 aperture lens, and features auto-HDR for excellent low-light performance. As you'd expect, the Note 8 doesn't miss out on anything in this area. From USB Type-C to 3.5mm audio jack, it has every connectivity option covered. Gigabit LTE and Wi-Fi means that you'll have the fastest possible data too. A beast phone needs a monster battery. 3,300mAh is big enough by our reckoning. Add in fast charging and wireless charging and we have no complaints. If you're searching for the phone that can beat all others, you've got it with the Note 8. 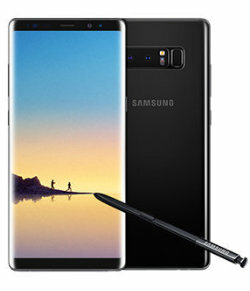 Physically massive, massively capable, and massively expensive - it's got to be the Note 8. If you don't require the S Pen, then you'll find that the Galaxy S8+ is almost the same, but slimmer and lighter.